Jirachi's official artwork from Pokémon Ruby and Sapphire. Jirachi (ジラーチ, Jirachi) is a legendary Pokémon. Jirachi is a Steel/Psychic-type Mythical Pokémon introduced in Generation III, and is categorized within the Pokédex at #385 as the "Wish Pokémon". It is said to be able to grant the wishes written on the notes on its head, a reference to the Japanese festival Tanabata. Despite its DOJO!! description Jirachi cannot learn Fly in any game, though like other Pokémon it is depicted as being able to float. —Pokémon Encyclopedia, Smash Bros. DOJO!! Jirachi appears as a Poké Ball Pokémon in Super Smash Bros. Brawl. It will drop numerous stickers upon release, before flying away. Jirachi, Mew, and Celebi will appear 1/493 of the time individually, which is a reference to there being a total of 493 Pokémon in Generation IV (at the time of Brawl's release). This is the rarest frequency of appearance for a Poké Ball Pokémon. This has given some evidence to the secret Pokémon Arceus, the only one out of 493 not revealed at the time of Brawl's release. A Wish Pokémon. It's said to awaken for seven days every thousand years, with the ability to grant any wish asked of it. It is truly a Pokémon of which dreams are made. In combat it uses its wish power to attack. Its attack Doom Desire, which causes light to rain down from the heavens to do tremendous damage, is especially powerful. 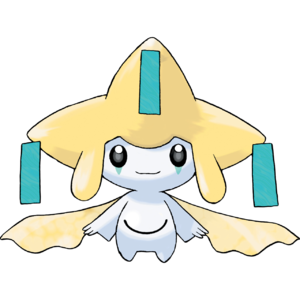 Jirachi has no gameplay-related role, only appearing as a trophy exclusive to the Wii U version. Jirachi's trophy is part of the Legend of Pokémon Ruby & Pokémon Sapphire Trophy Box. Since Jirachi is only awake for seven days every one thousand years, it's an even bigger sleeper than Snorlax! It can't just be sleeping the whole time, though. It's probably hard at work deep in the land of dreams, strengthening it's ability to grant people's wishes. If it detects danger while asleep, it can fight without even waking up! Jirachi returns in Super Smash Bros. Ultimate as a Spirit. This Spirit is Legend class (4 stars) and a Support Spirit. It's power is Fast Final Smash Meter. It costs 2 slots to use this spirit. The player can Summon this Spirit by combining the Luma spirit, the Star Rod Spirit, and the Starlow Spirit. Confirmation of Jirachi's appearance in Brawl on the Smash Bros. DOJO!! This page was last edited on April 5, 2019, at 23:15.